You might have seen that we recently launched a campaign taking a zero-tolerance approach to abuse towards our staff. And, one of the most common types of abuse our examiners face is from candidates taking their driving test. I'm a driving examiner, and I experienced a verbal assault and threatening behaviour at work. I'm sharing my story, anonymously, to help you understand what it's like to be on the receiving end. During a normal working week, and what seemed like an average day, as usual I took a candidate out on a driving test. We began the independent driving section of a test, which involved following signs. The candidate was required to turn right, third exit. He approached the roundabout in the left lane, and as we emerged he said to me "I don’t know where the f**k I’m going". I told him that we were turning right, third exit, repeating the sign that he was following, but told him to do what he thought best. He did turn right, from the left lane. We came up to the next roundabout, which was also a large roundabout, with large directional signs. Once again he positioned on the left, for a right turn. As we emerged on to the roundabout he said "I don’t know where the f***k I’m going you f*****g b***h, you’re supposed to give me directions." I repeated to him that we were turning right, third exit, and to follow the signs. At this point, he accelerated harshly to join a dual carriageway. "I'll show you who's the clever one"
He began erratically steering from the left to the right saying, "You think you’re so f*****g clever, I’ll show you who’s the clever one." He steered across the solid hatching, directly into the first lane of a busy 3-lane dual carriageway. It caused the car in that lane to swerve sharply to the right to avoid us. He then resumed the erratic steering, swerving across all 3 lanes of dual carriageway, screaming at me "Not so f*****g clever now, are you?". As our vehicle was dual controlled I waited until we were in lane one, and used the dual brake and pulled the car over. I got out of the car, and he screamed at me, "You better start running then b***h, because I’m going to mow you down". I told him that if he moved the car that I'd phone the police. Luckily, near where we had stopped there was a bridge which had a crash barrier in front of it. I stood behind that and rang my test centre manager, who came out and got me. My manager took my next test out for me, to give me some time and I filled in an incident report. The candidate also received a letter to tell him that his behaviour had been unacceptable. I later learned that he had written to complain that I had scared him by leaving him on the dual carriageway. I remained entirely professional, staying calm throughout the test, and I didn’t even raise my voice during the incident. I’d been an examiner for about 8 years at that time, but this was the first time that anything like this had ever happened to me, and it really shook me up. 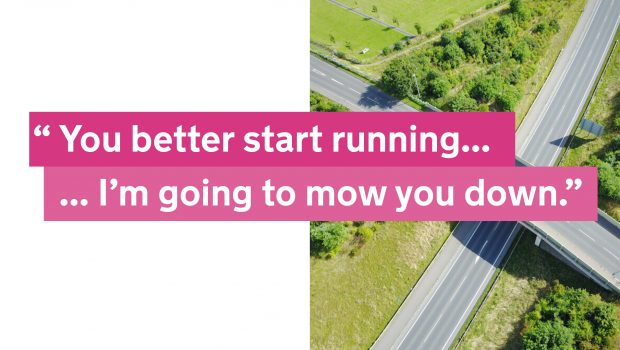 For 2 weeks after I felt really uncomfortable when we approached dual carriageways, and for a good 6 months I didn't feel the same about the job. Following an increase in incidents like this, we’re now working with the police and other organisations to make sure the full extent of the law is used when our staff are assaulted or abused at work. This now means that abusive candidates can be banned from test centres, forced to have an extra member of staff in the car on tests or charges brought against them for criminal prosecution. We hope by sharing this story with you, you'll understand how behaviour like this can affect our staff. Make sure you're signed up for email alerts, or follow us on Twitter and Facebook for the latest updates about the service. I am sorry to hear of your account with the candidate, but this is the way of the world now days. Don't forget we have to teach these people ! You just had the candidate for 40 minutes, we have then for 40 hours ! and they often cancel lessons and don't pay on time or at all. Ive got 100's of stories like yours. I wish they could be banned from lessons too. In our LGV training, we tell our candidates that ANY abuse from them, we take them back to our centre and escorted off site. We will not accept this behaviour at all. We also warn them that no abuse will be tolerated towards the examiner either on the test or during debrief upon return. If a candidate gets that upset he shouldn't be driving. What a strange post...it's not my experience at all and it's far from common as the examiner explained. PS. you can decline lessons...you don't have to continue with any learner...it's in your hands. I agree, unacceptable behaviour, don't put up with it, eventually they may well get the message. That's terrible. Nobody should be spoken to or treated like that. My blame goes squarely on the instructors shoulders. (I am presuming though, he'd had lessons) the instructor surely must have done a mock with him using the standard examiners instructions, if not, then it's certainly partly his/her fault and the dvsa should be bringing them in for questioning too. That is absolute nonsense! Mock tests are a completely useless exercise. What a pupil does on test or after passing a test is no reflection on who or how they were taught! Instructors are paid to teach road safety and give encouragement and confidence not do pointless mock tests because they want a 40 minute rest. If a pupil swears or behaves in this way examiners are paid and well trained to deal with it. Brake stop and get out! Make it clear that you will abandon the test if such behaviour occurs inside the the car or out, and a Criminal Charge of Harassment ( Please look up the Legal definition of Harassment in the Act) will place on the local Police Station, they will go to their address and give them a first and final warning. If the same pupil abuses an examiner again he will be arrested and charged. So make it law that abuse to an examiner is a five year exclusion from a diving test. And nine points. Plus an extended test upon completion of the ban. I agree totally with you Paul,also we don`t need people like this on our roads, sadly its seems to be a sign of the times but that doesn't make it right for anyone to treat anyone doing their job like that. I`m pleased that DVSA is having a zero tolerance to any type of abusive behaviour towards their staff maybe it might be worth having body cameras on during the test as proof of any type of abuse ? I just hope that the full arm of the law gets behind them plus the courts. This is astounding and wholly unacceptable. The physical injuries might have been horrific, and the psychological effects should not be underestimated. For some people they would be career-limiting. Why did you not seek a prosecution? To call anyone a "b***h indicates a deeply scarred personality and this driver may have previous convictions or warnings. I hope you are okay now. Watch out for signs of trauma - they commonly re-emerge in the 2 or 3 months after an incident. We had a laugh at the end of my test, A dog jumped on my bonnet on the 3 point turn. I went slowly in to the kerb and got a rope out of my boot and took the dog in to the nearby police station. The examiner directed me back to the test centre and I thought I had failed. The examiner then laughed and said he did not know if there was a procedure for dealing with a dog on your bonnet on a 3 point turn. He asked me a couple of questions and issued my pass certificate. I have never had a dog on my bonnet since. I don't think he wanted to take the risk of getting me back for another test. Bad behaviour shouldn't be accepted. The candidate's instructor equally should be in question. Also at the beginning of the test all candidates should sign an undertaking regarding misbehaving and in such event, they shouldn't be allowed or entitle to undergo and carry on with their test. It has become apparent that this kind of behaviour shouldn't and will not be tolerated. Why would the car have dual controls if it wasn't a driving school vehicle? Poor obs. It's hardly either the instructor's fault or responsibility. Who knows what caused this candidate to behave so badly. Most Instructors would have dumped a customer who showed this kind of attitude, and would never have let him get as far as a test centre front door. I think the point he made when he used the Dual Controls to stop the car - indicates this was a driving school car and quite rightly the instructor should be called in to account for this one. I once had a pupil 'go for' an examiner during the feedback at the end of the test. He had never displayed any kind of attitude problem prior to that so I couldn't have warned the examiner in advance. Fortunately I am big enough to have been able to drag him from the car and 'remove' him from the test centre. The instructor can't necessarily be held to blame. Obviously disgraceful behaviour. Was the ADI asked about this candidate afterwards? And I was under the impression that 'abusive candidates can be banned from test centres, forced to have an extra member of staff in the car on tests or charges brought against them for criminal prosecution' had been in place for years. Am I wrong about that? Very sad no one should expect that sort of abuse in the workplace or anywhere. I sincerely hope this particular candidate was never allowed to have a driving licence. Given the behavior and attitude at a time when one would reasonably expect best of both - Can you imagine what they would be like on the road and free to do what they pleased - HOW LONG would it be before they killed someone? A driving licence should be a privilege not a right. I would fully support any "extreme measures" to keep this sort of driver off the road permanently; with "extreme penalties" if they breach the law. There are enough ways to die on our roads now. We definitely do not need lunatics like this one. I fully agree with you. He sounds unbalanced and could be a potential road rager in the future. with Driving Examiners - after all we are all rooting for road safety! James, ADI, Royston. Its shocking that this happens. The sad thing is, people like this will eventually get a license and they will kill someone or cause an accident. If they are like that a driving test with an examiner in the car, what the heck are they going do when someone cuts them up or upsets them. Sorry this happened to you bud and thank you for sharing. Fortunately, this has not happened to me, yet, but I've only been doing this for just over a year. Such behaviour should result, initially, in the candidate not being allowed to take another test anywhere for a period of at least 3 months. Unless such behaviour is met with tough responses, it will not be responded to in a way that prevents it in future by making examples of such individuals. Why don't the authorities who oversee all tests just bite the blooming bullet and make it compulsory for all examiners to cary some form of recording equipment during the test. This will solve the issue of ---- dispute and intimidation in an instant. We'll be trialling body-worn cameras for driving examiners over the next few months, to help prevent incidents like this occurring. Dear Olivia, it is certainly a sorry state of affairs that we all seem to be having to use cameras now days. I have two CCTV cameras in my vehicle. One in the front pointing out the front windscreen and one in the rear pointing out the rear window. When I had these installed I took the time to write a letter to my local test centre informing them that I have CCTV cameras. I also made it clear that these cameras were not recording inside the vehicle but were recording the road in case of accident or incident. I personally don't have any issue per-se with body cams, however I will point out one thing. The DVSA have made it very clear that they do not allow cameras facing inwards to be used in the vehicle whilst on a test that may record the exmainer. Examiners make it clear that any footage obtained using cameras that feature the voice or images of the examiner will are not allowed to be used under data protection act without the permission of the DVSA. I would like to point out to you that under the law instructors and candidates also have the same right to refuse the DVSA to use any footage obtained without their permission. If DVSA continues to refuse the use of cameras in cars, which are there to protect the candidate and instructor, they cannot assume that they have the right to record without consent either. And placing this in your terms and conditions is not acceptable under contract law as it is an in unfair term that does not accord the instructor with the same right and remedy. I would also remind you that a (driving school) vehicle is private property, and therefore examiners enter the vehicle with consent by the owner of the vehicle only. I would not allow anyone to enter my home with a camera attached to their body without first asking my permission, and therefore as I attend most driving tests by sitting in the rear of the vehicle, I would also require the DVSA or examiner to seek my permission before entering my vehicle with a camera. Remember that instructors have NO CONTRACT with the DVSA other than to teach to the correct standard and to attend a standards check when requested - we do not work for the DVSA. On the day of the test, my pupil has a contract with the DVSA, and the pupil has a contract with me to hire my vehicle for the test. Despite the old fashioned assumption that the instructor is presenting the pupil for test - this is not the case, my pupil is simply hiring my car for the test. I reserve the right to refuse the use of my vehicle if I do not believe the pupil is at test pass standard or may be dangerous. Anyway, I digress. There is not one rule for one, and one rule for the other, we are all equal under the law. This MUST be considered before body cams are issued. How awful! I would never have thought of a driving examiner being thus treated. You would think people would be on their best behaviour. Judging by the notices about ' our staff must not be abused' that I now see wherever I go - my doctor's surgery for example - the driving examiner is far from alone. Also I have read reports of working ambulance drivers being assaulted. It's getting that all those on the front line everywhere have these maniacal types to deal with in the course of their work. I don't think I could cope. I hope this blog instructor has not been too traumatised by the experience and hope that the talks with police lead to a solution. As the candidate was clearly driving in a deliberately dangerous manor, then surely it would be easier to put a note on the system stopping them from booking another test. It would send a clear message that this sort of behaviour will not be tolerated. Failing that with the police now moving towards personal cameras, to prove public behaviour which can then acted upon this would be an alternative so that charges could be brought properly. What happened regarding the test candidate in this case? Surely DVSA pursued some sort of action against them; even if it didn't go to court. Organisations such as DVSA have a duty of car to their employees and this sort of behaviour is not only threatening but at the very least driving without due care and attention. Did DVSA contact the Police to see whether this was caught on any cameras; there are a lot about. You say if was a dual controlled car; so I assume an instructor was with them. If I was the ADI, I would have demanded the Police attend when I collected the car. I am so very sorry to hear of your experience. It is totally unacceptable. I totally agree with the action that is being taken. No one should have to feel that this is what they may face at any time and certainly not when carrying out your job. Perhaps some sort of video and audio capture device could also be used in vehicles during tests. This will of course add extra pressure for some people and again an example of the minority spoiling things for the majority. This would also protect staff against those who are also prepared to lie. Shocking though this story is, it is clear that the outcome could have been even worse if there had been a colision or the location offered less opportunities for protection. I don't want to drive on roads with drivers who demonstrate this type of behaviour but sadly I think I may have encountered one or two in my time. I can well under stand the examiners fear after such an incident, and would go so far to say that individual concerned should be never allowed to take any further test and be banned from driving for life. This was obviously an ill prepared test candidate, hopefully not presented for test by an ADI, who took out his frustration on the examiner. Absolutely unforgivable behaviour. Never mind having two examiners in the car next time he should not be allowed to take another test for 12 months and have to attend anger management sessions; if he has that attitude on test he will likely display road rage as a fully qualified driver. I wish people would stop keep trying to pin this on "the ADI". No ADI is going to put someone in to test in THEIR car, with THEIR badge in the window, if they KNOW that that someone is going to turn into some sort of psycho. Jeez. Some of the newer ADIs would do well to accept that there are people out there who are not "normal", but that isn't apparent from their standard behaviour. Some candidates might crack up and finish in tears, totally unable to continue the test due to pressure. Equally, there are some people like the one in the article who take it completely to the opposite end of the spectrum. Years ago I had one pupil who could already drive and who was test ready. He was not the nicest person to teach, because he thought he knew it all. He failed on something, and from what he was saying afterwards I remember asking him how he felt about the examiner. He replied "I could have smacked the c***". I've had a number of others who have blamed the examiner explicitly and aggressively if they have failed (with me, or with other instructors). In more than one case, parents have become involved and suggested bias, and insisted on taking tests at different test centres. I won't have anything to do with such criticism, and I say so. Clearly. I have stopped teaching more than one because of attitude issues. So I resent the suggestion that if one of these people kicks off, it is in anyway MY fault. As a driving instructor I am appalled at the actions of the candidate and I wonder if the candidate was presented to test by an ADI/PDI, as they sound as though they did not understand independent driving. If cameras (including audio recording) were allowed on test it would provide proof of actions of candidates and also examiners. It could also be useful feedback for pupils if they are unsuccessful. We'll be trialing body-worn cameras for driving examiners over the next few months, to help prevent incidents like this occurring. That must have been so frightening. Not sure if i could continue like this examiner have. Thank goodness there was duals available which incidentally i believe should be made compulsory on driving tests. All these other changes are being made but nothing to make it safer for examiners. By the way i'm an instructor with duals and firmly believe this should be seriously considered before someone is seriously/ critically injured. Time for examiners to wear body cams as do the police. I am a retired SDE and I am afraid this a pretty regular thing, unfortunately it is not far and few between but a regular happening,but examiners don't bother to remark on it because if we did we would constantly be writing reports against these people but as we know examiners don't have enough time between tests as it is, but I agree these people should be banned from taking a test. Unfortunately these idiots are all around us on the roads, I have on many occasions presented the police with CCTV evidence and the culprit has received a knock on the door, I'm not sure what the outcome was but at least they'll know, SOMEONE IS ALWAYS WATCHING. I do hope the examiner involved is ok.
Due to bad behaviour and bad driving in general not being penalised by the law, it is unfortunate that many motorists nowadays have dash cams fitted and I think a good way of keeping instructors and examiners safe is not for the examiners to switch the volume off during the driving test. Surprising that the Instructor had not identified this trait in the student, unless, of course, he did not attend with and ADI. Maybe this needs to be addressed? The name of this candidate should be publicly named and shamed. Maybe all candidates submitting a test application should have to provide a head and shoulders picture which can be displayed alongside naming and shaming. We must do all we can to keep this person off the road. Although I fear he is the sort who will drive unlicensed if not already doing so. I know and understand that people express their emotions in all manner of ways when they are under stress or nervous but the behaviour exposed here is far beyond any acceptable tolerance. Graham is right, he will drive unlicensed. Banning people like that from holding a driving licence or taking a driving test for 5 years will have little or no effect. It seems to be an unfortunate sign of the times - that self-discipline is so lacking. I hope all will be well with this, and other examiners, who have had to undergo this sort of ordeal. How come he was on his driving test in the first place? Seems to me many driving schools just want the money regardless of the safety of anyone. Something is not right here and it worries me. Truly SHOCKING!!! In my 18 year career I've never argued with an examiner and I always teach my pupils to respect the eximiners and their dicisions and do not acusse them of things such as racism. I also tell them that whether they pass or fail depends on how THEY DRIVE, not because of the EXIMNERS. I agree with some of the comments above that tougher action should be taken against this kind of people. I would like to add one more thing that DVSA should alow audio to be recorded during test, which can be used as an evidence. I hope the examiner has recovered from the trauma he suffered.Thanks for sharing your experience and best of luck for the future. I'm really sorry you have been a victim of such nasty person, I'm an ADI an had some bad experiences with other drivers, I think the examiners should carry personal video recorders for their own safety. This kind of behavior must be stopped by any means possible. I really hope that you completely recover from this awful experience. I believe that people that abuse the examiners should be banned for life not just for a few months this would hopefuly stop this abuse. Am sad and extremely upset to read about what this examiner went through with this candidate. Sitting at the back of the car during a driving test sometimes ago, I witnessed a similar situation where my pupil threatened to use physical violence. He was verbally abusive but I interfered and tried to calm him down. The examiner was happy that I was in the car. In my opinion, the DVSA should take action to ban such person from driving until further investigations as to whether they should be allowed to have another chance. We already have crazy unsafe drivers on the road and most definitely, none of this type. Reading about this awful ordeal that the examiner had to go through, at least the car had dual control. May be the DVSA needs to consider the risk involved into allowing candidates on a driving test to take their own vehicle without Dual Control. Controlled car who knows what could have happened. It's an easy change surely and one that should be implemented under health and safety rules. I really cannot understand why the DVSA are prepared to gamble with the safety of their examiners. I once had an issue with a pupil that had the previous week a driving test and had failed. She contacted me with regards to lessons and so the following week I picked her up. She immediately came to my drivers side to get into the car and i explained in a professional mannor that we will go somewhere quiet which would give her the opportunity to settle into the car and for me to give a basic assessment. With this she gave me an awkward look, but i continued on. Once i agreed a few things with her we set off for a short drive, things were going ok until we reached a roundabout and after a few Q and A's on approach she became very irrate and verbally abusive by way of suggesting i was saying she couldnt drive. With this i asked her to pull over and she started to accelerate, still being aggresive and abusive. Upon telling her to pull over, she then began to threaten me when we stoped. As she was a danger at this point, i dualled her and told her to get out of the car. Fortunately this she did but in no quiet manor ! My only concern at this point was to get away from her. Anyway, upon doing some research it turned out that on the test she had taken previously, she had threatened the examiner in a very similar way because she had failed. This girl should have been reported back then by the previous instructor and it should have not got that far. Wherever possible as an Adi, I sit in the back during tests. We always try to practise the routes, so that problems can be sorted before the test takes place. We can then show them the drivers' manual or Highway Code diagrams and explain . A couple of times the Examiner has stopped the test and I have driven them back. I would expect the Examiner to stop the test as I think other instructors would and not take their temper out on my car and our safety. On one occasion I warned my pupil not to touch the Examiner, and another I asked them not to laugh at my driving, as I had to drive them back. Have myself been an ADI since 2002 and i praise the examiner for the timely action taken to ensure the safety of everyone from this candidate. On one occasion i had a stroppy know-it-all young 19 year old male pupil out on country roads in what is commonly known in this area as The Dengie Peninsula, numerous bendy winding roads with sharp left and sharp right turns in between tall hedgerows, it was basically yet another steering control lesson to help the lad understand why we steer with both hands and why we drive at appropriate speeds on national speed limit roads, explained to him on numerous occasions that the national speed limit is a guide for motorists not a target to aim for, as the lesson got into its first quarter the lad started driving faster and faster through a series of bends, not wanting to destroy the pupils confidence i calmly asked him "is this the appropriate speed for this type of road" ..... "IF YOU WANT ME SLOW DOWN TELL ME" he shouted /boomed out across to me, at that point we were now on a straight section of road, without him realizing i placed my foot gently down on the dual brake control and as we came to a stop dipped the clutch then lifted it to stall the car, he looked at me in total disbelief when i then said to him "that is the end of today's driving lesson" his reply was "SO WHAT HAPPENS NOW" to which i replied "you sit in the passenger seat and i drive you home" Boy o Boy was he angry, throws open the drivers door and stomps around the back of the car hurling abusive words at me, o well time to go i said to myself, got into the drivers seat of the car restarted it and drove off leaving him 35 minutes from home and without his phone or jacket that had been placed on the back seat, i drove back to his house and gave his parents both the jacket and phone and politely advised that they're son had left them in the car when he got out, i then drove away, later that evening the father rang my mobile and asked why his son had been ousted from the car, told him what had happened and total silence from the open phone line, then the father exclaimed "sorry about that it's about time someone stood up to him for abusive manners, will you take him back" my reply was "No and there is no charge for today's exercise". Never saw him again and all his mates came to me afterwards for is lessons and all knew i had turfed him out of the car even before starting lessons with me. Yes, one of several good reasons why I am glad to view my driver training career from behind the safety barriers of retirement! I had only one client whose driving test behaviour was outwardly violent and his previous form was, given a limited intellect, just short of angelic. Fortunately he was extravagantly under-built, so his threats against his six-foot tall, athletically inclined examiner could be considered ridiculous. The serious issue here is the likely behaviour of these drivers if they ever get onto the road, legally or not. And it is worth recognising that the angel on a driving test is not necessarily any better. I have encountered one or two ex-clients in road situations that, on reflection, I am ashamed to have taught. Reading the account given by the examiner it's clear that this driver was presented for their test by an ADI as the car was fitted with dual controls, thankfully this has not happened to me. A colleague had a similar incident and they to were shook up. These incident should be reported to the police as they are driving in a dangerous manner and as such should be dealt with by the courts. Behaviour like this is Not acceptable! The one at fault is the instructor as it seems, from the Examiner description, that the candidate was not ready; the candidate was not able to follow directions and didn't know how to deal with roundabouts... It could be that he was one of those candidates that found an instructor at the "last minute" to take him to the test??? Personally, I Never do that! I had myself a candidate with bad attitude that was not happy with being failed so he started to insult and threatening the Examiner to which I promptly stud in between and advised him to stop it otherwise the Police would be called ... he did step away in the end and I told him to find another instructor. My applause to the Examiner that kept his cool and took a Professional approach to the situation. Horrifying story, my sympathy is entirely with the examiner. I totally agree with the comments above that the driver should not be allowed to sit another test for a good length of time, say twelve months. The problem is, of course, that someone like this will probably just start driving anyway, with or without a licence, and no insurance either. In my view this should have ended up in court. I think the abusive candidate should have a anger management course and then subjected to extended test. The problem, I believe, lies in the fact that anyone can take a driving test, irrespective of whether or not they have taken professional tuition with an ADI. He may very well have been driving alone, or with his peers, and never had any form of tuition. Parental influence may be equally as bad. Until we change our laws to make learning to drive with an ADI compulsory, these people will continue to rear their ugly heads! This one is probably the most extreme example, but a driving examiner never knows who he's getting in the car with, and most especially if the person presenting is not accompanied by an ADI. A change in the law is needed! I totally in favour of this test candidate being banned from driving for life, I have spent 27 years of my life in the motor trade, and come across this sort of person, and in my opinion they are not fit to be allowed behind the wheel of a car, ever. No one should have to endure that kind of behaviour. Clearly the idiot felt less confident in his driving ability "on the day" but instead of bucking up looked for someone to blame. Blameless society. Putting several lives at risk because of his own ineptitude? People need to start taking responsibility. Sadly more and more incidents, anywhere, over trivial things, have become the norm. A British disease? Some days it seems like it. None of which helps people like yourself and I'm sorry that it has clearly affected you. You did nothing wrong and clearly remained the consummate professional throughout. This person should not have been taking a test if he didn't know to approach a roundabout in the right lane for taking a third exit! The examiners are just doing their job and besides gave clear instructions several times. I agree with others on here the sad thing is they will be on the road and will kill or injure innocent motorists or pedestrians! Fortunately, such cases are still rare but I did have one guy like that a few years ago. He had already lost his licence, and his job, for drink driving. Of course he had to take his test again. On his lessons, he seemed repentant but as he came out of the test centre, he stalled it. Convincing himself that he had failed, he then drove aggressively throughout the rest of the test, at the end of which, the examiner (a thoroughly nice guy and an ex-police officer) failed him purely for the aggressive nature of his driving and his oafish inconsiderate behaviour toward other road users. I last saw the student head-butting and kicking a cash dispenser for its apparent lethargy in dispensing his money! Needless to say, when he rang me two weeks later with another test appointment, I declined to take him! You don't know the half of it. As a former ADI instructor and on the voluntary register for lgv instructors, I decided to gain more experience by signing on at an agency. I got that experience and more when I drove a bin lorry for a local council. The amount of verbal and physical abuse l received was unbelievable. On one occasion l was punched in the face! Press charges? Forget it! It's what the academics call "a learning curve "? Olivia, I note that you repeatedly state body cameras are going to be trialled. Many of us ADIs already have our cars equipped with video cameras..
We can only have forward facing cameras, which I understand, however surely allowing sound to be recorded would help the examiners case in such situations. As well as helping in strengthening a case where a crash occurs with another vehicle to confirm that the horn was sounded or not. Could you please explain the DVSA's reasoning for not permitting the recording of sound. As an ADI of 14 years, I am fully supportive of any initiative that will keep our excellent and professional Driving Examiners safe from harm. Fortunatley I have only had one bad experience with an abusive student on test. My driving school insisted that I take a student for test although I had not taught him previously. Upon being informed that he had failed, he became abusive so I grabbed him by the collar, apologised to the Examiner, then frogmarched the student away from the car while giving him a mouthfull about his disgraceful behaviour. I subsequently informed my School about the event; guess what? 2 weeks later they asked me to take him for another test. I declined, and left the School shortly afterwards. I suspect that this may have been what happened with the ADI in question. This should never happen, but that's the world we are in, maybe fostered from recent attitudes to 'not making people take full responsibility for their actions' as they develop into adults. But its double sided, how many people have felt aggrieved at a test result to be told the official line "I wasn't there so I really cannot comment"
I was seriously verbally assaulted by an SE on a check test, and he shook his fist at me. The DIA said they had a file on this SE all about his bad attitude but he was untouchable and to drop any thought of complaining. The DSA didn't want to know, trying to make me out to be a trouble maker. That was in the early 2000's and almost made me hand my badge back. Sad world we live in. As ADI's or DE's we need to prove we are 'Fit +Proper' for the job. Maybe learners need to do an attitude test before given a provisional licence. Nobody has a 'right' to drive. I would not tolerate this from any of my pupils. They would be looking for a new instructor. Their details would also be passed to colleagues in the hope that finding someone to teach them would be difficult. What we have here is an example of one of those humans. They are nice, nasty, kind hearted, selfish, gentle, violent, polite, rude and just about everything else you can care to mention. Instructors will have to instruct them and examiners will have to examine them. Parents/Guardians set standards at home. Instructors set the standard in their car. Examiners just have to hope the above set good standards. The examiner can and should end the test anytime the behaviour of a candidate falls below that which we would normally expect. It is indeed a very strange post ! Such behaviour can ever be acceptable however I must question why the examiner allowed the candidate to continue to drive through two roundabouts and then onwards still before taking action either manual or verbal. Only one side of the story is told and even then annonamously. I am not convinced that a poster campaign would have changed the candidates alleged behaviour. It took 8 years for the examiner to encounter such poor behaviour ! ! Maybe you would consider publishing the number of serious incidents that have taken place at test centres over the past 12 months a.ong with the ni bet of formal complaints against Examiners by candidates. This is the direction in which society is going in the UK. You can clearly see an increase in violence and verbal abuse. Can you imagine what this individual will be like behind the wheel once he has a licence? Unfortunately, I fear that the actions to be taken by the DVSA will be pointless. You report them to the police - what are the police going to do? Probably nothing, they don't have time for this any more, and individuals like this don't care any way. You ban them from test centres? They will simply drive without a licence. This is a direct reflection of current society and needs to be tackled at the top by the government. More police with greater powers is what this country needs right now. Why can't we record on driving tests? I know we can record the road ahead with a dash cam but can't include audio. If examiner's wear a body camera then students should be allowed to if they wish. Examiner's aren't infallible, they are human and candidates aren't without the need for protection either. If the dash cam could record audio that would of helped with a prosecution on this occasion had it had one. I find people on the roads so aggressive and impatient these days, often driving incorrectly on purpose because they don't care about other toad users really. For all of you blaming the instructor, how do you know that he or she had had enough hours with this pupil to know what they were like in terms of this horrendous behaviour? As instructors, are you never asked to cover test on the day with maybe just one lesson before hand? Usually this is the case when a pupil has been told they are not ready for a test; they go off to another driving school with a story about being let down by their previous instructor or reasons to that effect. We have enough of the public blaming instructors for everything, let's just be a bit more objective before we do the same here. Just saying.